It was recently discovered by a team of scientists that the Philippine tarsier (Tarsius syrichta) can communicate in pure ultrasound, issuing calls that are so high-pitched that human ears cannot perceive them. 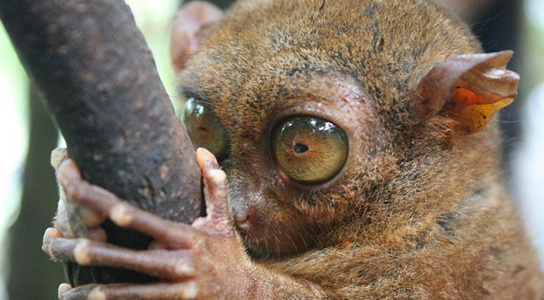 The huge-eyed tarsier definitely has arresting looks. Researcher Marissa Ramiser, an evolutionary biologist at Humboldt State University, California, noted that it was previously thought that the tarsiers are quiet nocturnal creatures. It turns out that they’re actually screaming so high that no one could hear them. Human ears can hear up to 20 kHz. 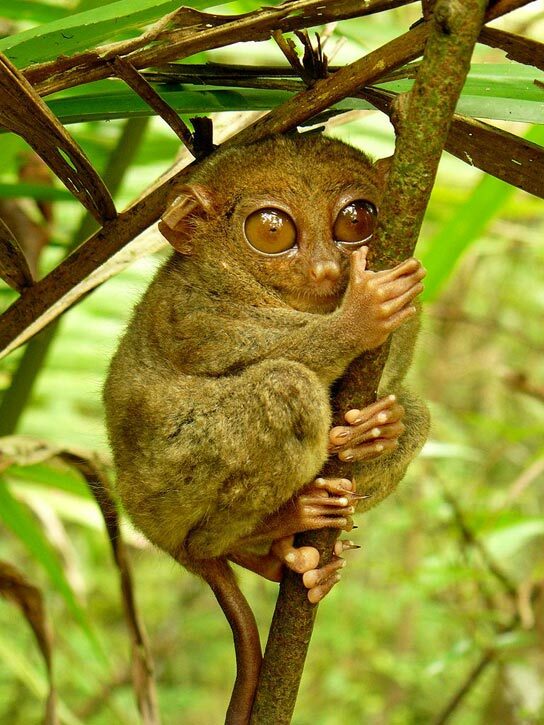 The Philippine tarsier can hear up to 91 kHz, and it cries out at the 70-kHz range. This implies that tarsiers’ hearing abilities are similar to the ones of bats, and far beyond any other primates on Earth. T.syrichta, one of the smallest primate species, can only be found on the islands of the Philippines. Fully grown, they’re the size of a human fist. Tarsiers lack a tapetum lucidum, the layer of tissue in retinas that allow for strong night vision. 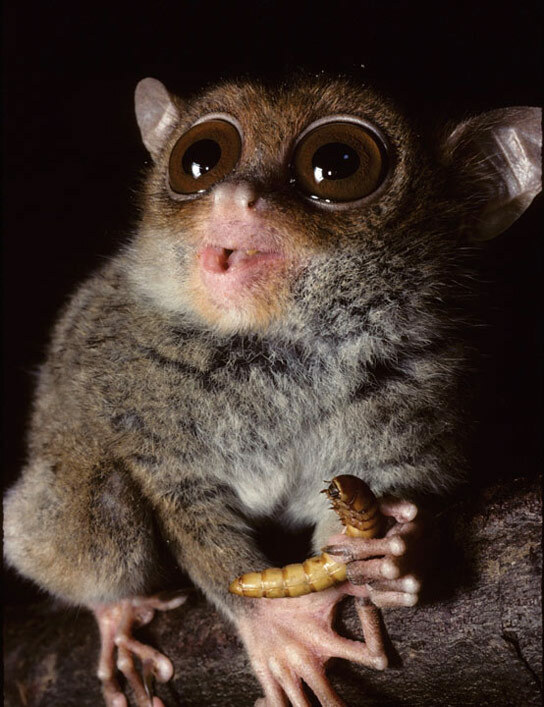 Instead, tarsiers have giant eyes. They resemble lemurs and lorises in many ways. Tarsiers are difficult test subjects, since they are endangered and don’t respond well to captivity. Ramsier and her colleagues captured six tarsiers on the island of Mindanao and placed each in a sound-dampening chamber, in which they were exposed to noises of varying frequencies. Electrodes were placed on their skulls to measure the responses of their brains. Once the tests were completed, the tarsiers were released into the wild. Each one was kept for about an hour. To find out if tarsiers could make ultrasonic noises, the researchers recorded them on the islands of Bohol and Leyte. Sharon Gursky-Doyen, a Texas A&M anthropologist, noticed that the animals opened their mouths and she couldn’t hear their cries. She took a bat detector and was able to record some vocalizations. The researchers captured the calls of 35 wild tarsiers using the microphone, and discovered that the animals cried out in ultrasound, ranging from 67 to 79 kHz. Their results were published on February 7th in the journal Biology Letters. Other primates do have ultrasonic elements in their calls, but the dominant frequencies are audible to humans. The other mammals that use ultrasonic communication are whales, dolphins, bats, rodents, and domestic cats. By communicating this way, tarsiers may be able to keep predators from hearing them. They might also use their hearing skills to locate insects. It’s doubtful that tarsiers can use echolocation like bats. Be the first to comment on "World’s Smallest Primate Issues High-Frequency Calls Like Bats"